The latest snowfall resulted in a rapid accumulation of 6″ or more. It easily wiped out all signs of the melting that had been going on the last few days, as well as the resulting ice. Before 5:00am we could hear the thrum of a diesel engine idling just up the road. That meant that the groomer was out on the ski trails. Never mind that this was the third day of spring. Nor the fact that I’d already declared I was hanging up my skis for the season. The opportunity was too good to miss. What I didn’t bargain for was the fact that the temperature had plummeted overnight. Two degrees registered on the thermometer. Really? All the layers I’d banished to the bottom of the drawer came back out again. I even popped toe warmers into my ski boots. And with a fierce wind blowing, I didn’t regret a single item. Perhaps it’s not too surprising that there was not a car in the parking lot, nor a single ski track on the virgin groomed trails. Who else would be out on this cold spring day before the sun was fully up? Shivering ever so slightly I set off, confident that the relentless uphill climb at Lester would help warm me up. 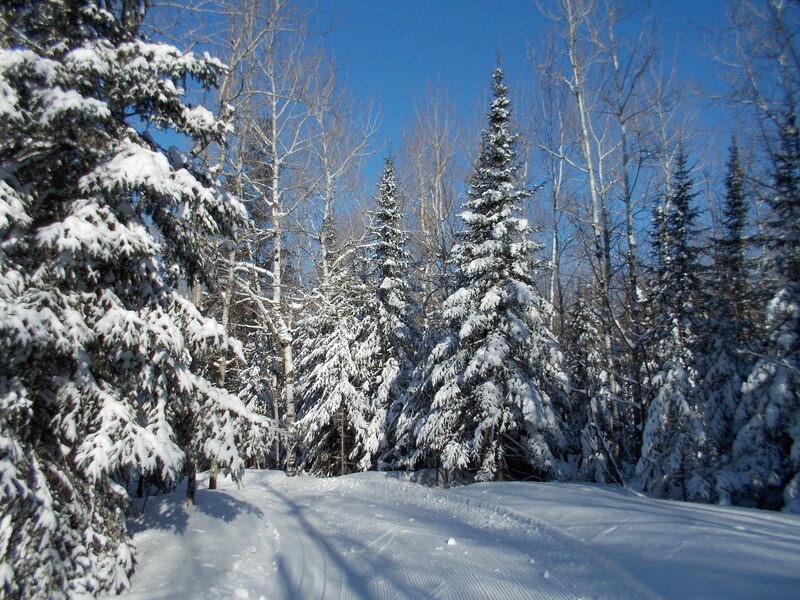 The woods were blanketed in snow, and the trail was firm and fresh. The crusty snow and ice that I knew lay beneath the new powder were deeply buried, as if the dicey spring skiing conditions of a few days earlier had never existed. The sun spread long shadows across the snow from its low angle, too weak yet to shed any warmth. But it was pretty. Even my tiny camera protested the cold by shutting down soon after I extricated the cold metal object from my pocket. Baring my fingers to the brutal cold, I learned to snap quickly to get one picture before it realized its battery was too cold to function. I had conveniently forgotten how slow the snow is when it’s that cold, and there was little glide to my skis. But I pressed on regardless. I even continued for a second lap around the trail system. This wasn’t about setting speed records. And I was no longer training for races. I could just ski for the sake of enjoyment. If I ignored the calendar, I could relish the perfection of the conditions, fooled into thinking what perfect winter skiing it was. Sometimes it’s best to live in the moment, oblivious to the seasons. 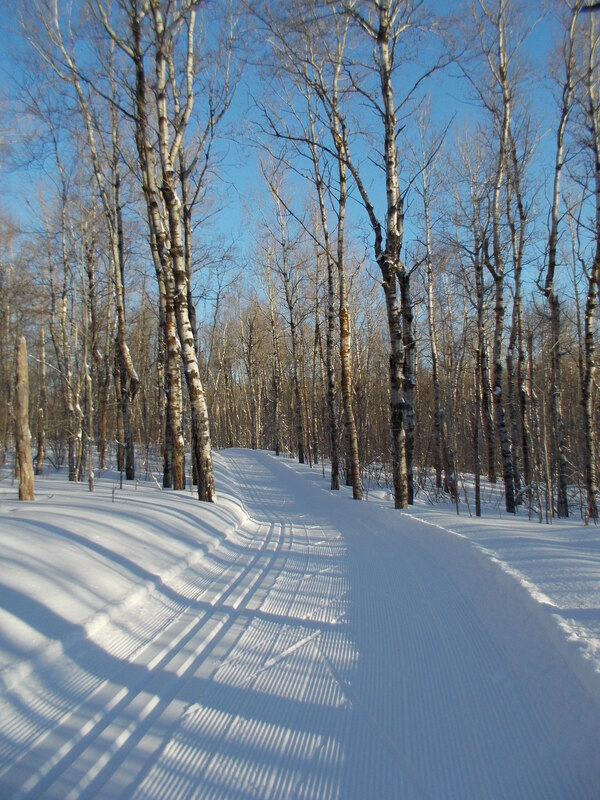 This entry was posted in Keeping Fit, Outdoors and tagged Cross-Country Skiing, Duluth Minnesota, Outdoors, Snow by Molly. Bookmark the permalink.